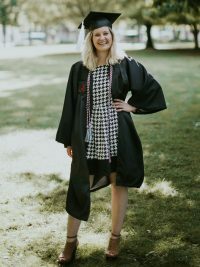 I graduated from the University of Alabama with a Bachelor of Arts in 2018, with a dual degree in French & International Relations and a minor in Anthropology. Dr. Sonya Pritzker piqued my interest in linguistic anthropology after lecturing on racism and language, and ever since I have been hooked on exploring linguistic misrepresentations of people. My undergraduate research assessed the discursive underpinnings present in American academic programs studying terrorism. While the rhetoric of the government and media is currently being scrutinized by scholars, I sought – and continue to seek – to understand how academic programs play a dangerous part in a long history of Middle East misrepresentation. I presented a piloted version of my research project at the Undergraduate Research Conference at the University of Alabama in the Spring of 2017. I then went on to conduct an in-depth ethnography and successfully presented the findings at the inaugural Society for Linguistic Anthropology conference in March at the University of Pennsylvania. While I hope to return to my research on the Academic Language of Terrorism, I am excited to be currently exploring how morality is mediated in the everyday interaction of couples in the south. What I want to know is how two people with an established history mediate the moralities of everyday life, from household values to larger community, religious, political, or regional values. By using the methods and theories of Linguistic Anthropology I can better access how shared norms, distinct beliefs, and misunderstandings that take place in everyday speech events manage the mediation of morality. I am hoping to situate my findings into a larger socioeconomic framework that might help local and international relations progress.